The Beach is great for taking walks! Beach chairs and towels are provided. We have a nice patio set on our deck as we spend most of our time there from sun up to sunset. You'll enjoy barbecuing outside and toasting the end of the day while you watch the sun go down over the ocean. Inside our Vacation Home: photos show the living room and bar area and our kitchen. Our newly remodeled 1-bdrm condo is smoke-free and sleeps 4. The living room has a a fireplace, queen size sofa bed and swivel chairs. We also have a nice dining room set in a separate area. Everything is new and fresh. We have mirrors and art throughout. There are 2 new flat screen TVs(with cable),, DVD, CD, wireless internet, and 2 phones. The kitchen is light and airy and fully equipped including a microwave and dishwasher. The kitchen was recently remodeled with all new appliances. We enjoy cooking and entertaining and we have what you might need to make your visit comfortable. Our bedroom which contains a new cal-king size bed with new bedding. The ceiling fan offers a nice gentle breeze. There is a TV phone, and a desk (with WiFi for you computer.) The bed and desk look out onto our front garden. If you open the window, you will enjoy the sights and sounds of the stream outside the bedroom window. Our bathroom and vanity areas are separated from each other for maximum usability. Our linens are new. We have been told by several that this is the best one bedroom unit in North Coast Village. They were referring to the location and the decor. We have created a special indoor/outdoor environment. Our cottage condo is truly 'a great escape'. Contact us for more information. Amenities: Beautiful North Coast Village resort-style complex: Lush grounds with waterfalls, streams and Japanese Koi fish ponds, gorgeous resort style large swimming pool, separate grotto-like jacuzzi, recreation room with billiards and table tennis, fitness room, sauna, putting green, and clean laundry facilities. We are fortunate to have two (2) covered parking spaces in the gated garage. 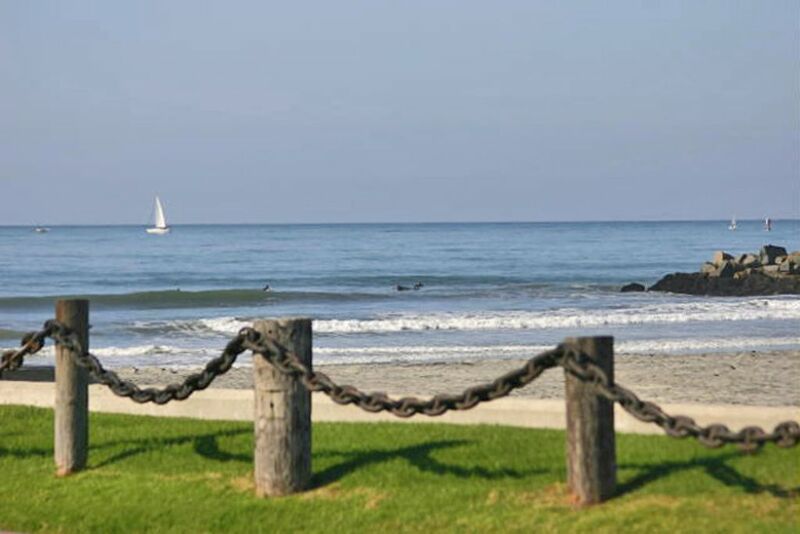 Activities: We are located a five minute walk from the Oceanside Harbor where you can rent kayaks, jet skis, go on a dinner cruise or a chartered fishing boat. There are shops and restaurants of all sorts in this charming Cape Cod style harbor. We are a 20 minute walk to the pier where you can walk, fish or take in a meal. You can also walk to the train station. Area: Oceanside is conveniently located for easy day trips by train or car to: Disneyland, Knotts Berry Farm, Legoland, San Diego Zoo, Sea World, Wild Animal Park, Del Mar Race Track, and Tijuana, Mexico. Owned by Bob & Joyce Simpson since 1989. We live an hour north of Oceanside and have designed our condo as a welcome retreat. We go and visit whenever we don't have rentals and we take good care of it. As marriage & family therapists, we know the value of getting-away to a peaceful setting.We have vacationed in Hawaii many times and when we are at the beach in Oceanside, it feels like a little bit of Hawaii. We plug in our i-phones and play soft music (or Hawaiian music) and let the sound of the waves and the beautiful sunsets over the water do the rest to soothe our souls. Of course, we also enjoy our condo when we can bring our grandchildren down there and that creates an entirely different feel. There is so much to do with kids from ocean sports to kite flying, to fishing to biking and, of course eating out! Lots of fun activities for all ages! Great beach...feels like Hawaii! Peaceful, quiet & relaxing! Easy access to the beach. Indoor / outdoor living. I enjoy watching the birds fly over from the estuary. There is no one in front of us. It feels very private. Nice yard and then there is the beach! We sit on the longest widest beach in San Diego County. We have an excellent view of the sunset. North Coast Village boasts a resort-style pool, a grotto-style jacuzzi, a workout room, ping pong, pool and a putting green. There are beautiful streams and gardens throughout the resort. Look at our photos and you will see how close we are to the ocean. The only thing separating us from the sand is a small strip of grass (our backyard.) The view is 180 degrees unobstructed...YOU ARE THERE! All linens including beach towels. Bring your laptop and put it on the desk in the bedroom by the window overlooking the garden & stream or you can take it outside onto our patio! We love to cook and have stocked our kitchen well. 2 flat-screen TV's with Cox cable. This is the best feature of our ground-floor cottage. We spend all our time out here so we call the patio 'our family room.' Great views, peaceful & quiet. easy indoor/outdoor living. Suitable for a romantic retreat for couples or a family of 4. Well kept and comfortable. 2 Parking spaces. We are only 35 miles from Downtown San Diego. We are walking distance to the harbor with restaurants, shops and beach toy rentals. We are a short drive from everything else.